As financial service providers (FSPs) have increasingly targeted smallholder farmers as potential customers, there is a growing need for FSPs to access unique tools and develop new skills to reach this customer segment. To help address this need, an ecosystem of ‘Business Development Services (BDS) providers has developed, at both local and international levels. BDS includes a range of external advisory services that provide or develop the capabilities needed to design, deliver, and support FSPs’ products and operations. This includes a wide range of offerings, such as strategic planning, inclusive business design, data and digitalization, and monitoring and evaluation (M&E). To better understand the experiences and perspectives of FSPs who utilize these BDS providers, ISF Advisors surveyed 47 organizations from around the world, predominantly MFIs, commercial banks, NGOs, and social lenders. The respondents were high-level decision makers, over half from the c-suite level, with broad knowledge of and authority over the decision to hire external BDS services. Our online survey collected a range of data on both the organizations’ individual experiences with BDS providers, as well as their assessment of the availability, quality, and affordability of different categories of BDS. The following highlights from the survey are offered in the hope that all market participants—FSPs, BDS providers, and donors—can better understand this ecosystem which is supporting and shaping the development of financial services for smallholders around the world. Respondents were asked to rate the various categories of BDS according to their availability, quality, and affordability. ‘Strategic planning’ and ‘digitization and data’ were the highest rated overall, but these high composite scores mask the divergence between the high perceived availability and quality, and low affordability. Meanwhile, capital structuring was among the lowest rated for all three dimensions. As the market for financial services becomes increasingly complex, particularly with the use of blended finance, the lack of high quality access to BDS that support capital structuring for FSPs may act as a constraint on the market’s ability to evolve quickly. As part of the survey, FSPs were asked what factored into their decision to hire external BDS providers, rather than build capabilities in house via hiring or training existing staff. Of the potential factors listed, FSPs were most likely to rate ‘BDS builds in-house capabilities via skill transfer’ and ‘BDS offers access to higher quality services’ as either ‘pretty important’ or ‘very important’. The high number of respondents mentioning skill transfer suggest that FSPs are not simply choosing between ‘build or buy’, but are approaching BDS as a ‘buy and build’ opportunity. This offers insight into how BDS providers can tailor their service delivery approach to better meet FSPs’ needs—by explicitly including training and in-house integration components in their project scope. 85% of the surveyed FSPs had previously hired at least one BDS provider, and most had hired BDS providers for a range of different services. ‘Digitization and data’ was the category most frequently reported for previous BDS purchases, with ‘inclusive business design’ and ‘strategic planning’ close behind. When asked to indicate their interest in hiring a BDS provider in the next two years, irrespective of cost, FSPs ranked ‘strategic planning’, ‘fundraising’, and ‘digitization and data’ as their highest priorities. However, when asked to take costs into account, the high interest in ‘strategic planning’ and ‘fundraising’ did not translate into planned purchase of services. Instead, ‘digitization and data’ was by far the most likely category for planned purchases of BDS. Coupled with the high rates of previous purchase of ‘digitization and data’ BDS, our data clearly points to the importance of this particular category of services. Meanwhile, the lack of planned purchase for ‘strategic planning’ and ‘fundraising’ suggest that these particular BDS categories may be de-prioritized in favor of more tangible business operation services. 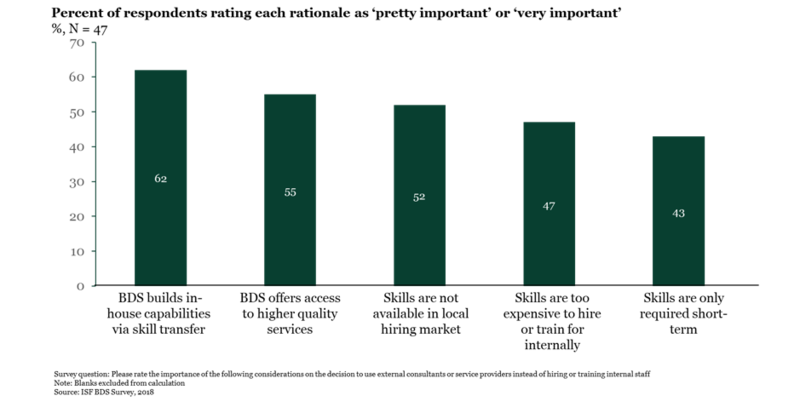 With over half of the respondents indicating that their organization could afford to spend less than USD 25,000 on external BDS within the next year to address crucial business needs, this forced de-prioritization is natural. However, it does suggest that external financial support may be required to bridge the gap between interest and ability to purchase these types of BDS. Further, given the limited BDS budgets, two particular questions present themselves. How can FSPs approach and structure BDS to get the most ‘bang for the buck’? Within the survey, we explicitly asked FSPs how donors could best help facilitate access to the capabilities that their organizations need to grow and succeed. In addition to the earlier data, which identified high-interest categories of BDS getting deprioritized due to cost, a key insight emerged around engaging with FSPs to jointly determine how and when BDS would be most helpful to the organization. Consistent with our findings that FSPs are using BDS to access external skills, while also building in-house capabilities, FSPs evenly ranked ‘internal capacity building’ and ‘financial support for BDS’ when asked what type of donor support would be most helpful to their organization. Donors should actively engage with FSPs to determine which of these approaches is the best way to access new skills given the organization’s present and future needs. The factor mentioned most often when asked about the success or failure of a BDS engagement was whether or not the BDS provider had a robust understanding of the context shaping the FSP’s business. In addition to basics, such as sharing a working language with staff and understanding the country of operations, multiple FSPs mentioned the need for providers to tailor their understanding and recommendations to individual circumstances, rather than applying a one-size-fits-all approach. Another respondent identified “the ability for BDS not to assume a lot of things or to try to bring their experience from other areas into the business. Once we got them on board regarding our real realities and context, they were able to provide services that assisted, especially in loan officer training. When structuring BDS engagements, donors and FSPs should strongly consider to what extent the BDS engagement will integrate with and strengthen existing business processes. Finally, and particularly important for donors that fund BDS services for FSPs, was the issue of buy-in. 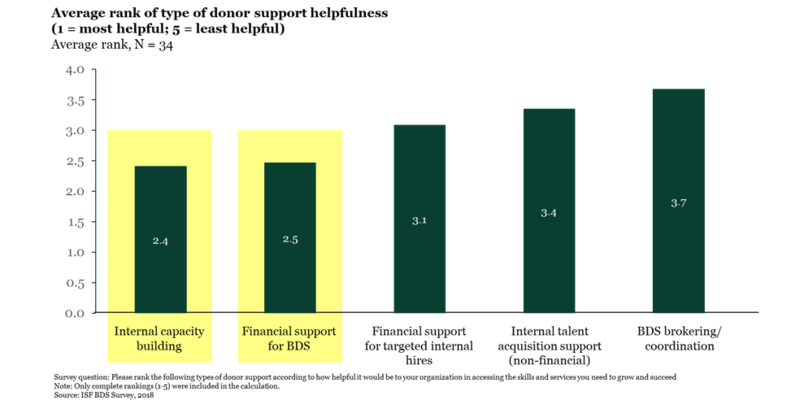 Multiple respondents discussed experiences in which externally funded BDS did not match the FSP’s perception of their own needs—as one respondent summed up, “imposed on us by donor and bad alignment.” Without the necessary buy-in within the organization, respondents flagged scenarios in which there was “no attention from the management, no commitment, and no political support of the management.” A participatory approach to determining the appropriate BDS or capacity building solution for a particular FSP can help avoid scenarios in which fees and effort lead to disappointment rather than success. Given the highly diverse nature of both FSP needs and BDS markets around the world, our current data can only provide general trends and perceptions of the BDS market. To develop more specificity in these insights, there are additional steps to be taken and questions to be addressed. In addition to deploying the survey to a larger audience to achieve a higher confidence level, ISF is planning to supplement the survey with interviews of both FSPs and BDS providers to gather deeper insight and pressure-test survey results and conclusions. Given the dynamics identified, what role can different market participants play to ensure that quality BDS is accessible and effective in supporting the evolution of smallholder finance? Given the major focus on ‘digitization and data system development’ within the BDS market, how should this particular set of capabilities and tools be developed and made available in the coming years? With access to the right tools and capabilities, FSPs will be able to better identify the needs of their smallholder customer segments and ultimately develop a stronger, more sustainable business model to meet those needs. Our data clearly show that BDS providers play a central role in this process, and ISF is committed to further understanding and positively shaping the evolution of such a critical aspect of the smallholder finance ecosystem.